While lifting rocks on the west shore of the lough, we were excited to find a beautiful flatworm. 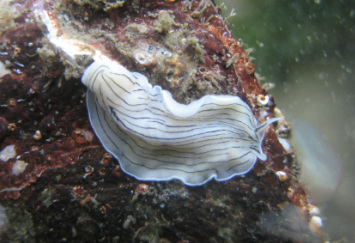 The ‘candy-striped flatworm’, Prostheceraeus vittatus, is striking with its black and white striped pattern and large cephalic tentacles. This worm is reported to feed on sea squirts, often devouring large individuals from in the inside out. There were plenty of large solitary sea squirts nearby that may have become the next meal for this flatworm. Three urchins are present in Lough Hyne: Echinus esculentus, Paracentrotus lividus, and Psammichinus miliaris. 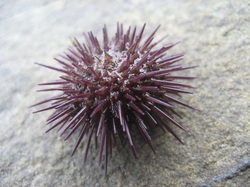 All three urchins are formed from globular, calcerous tests, which are covered with moveable spines. The body has five double-rows of tube feet that, paired with these spines, allow it to move slowly. All have mouths on the undersurface of the test, and are equipped with a complex eating mechanism called an “Aristotle’s lantern” which includes a set of teeth that can move multi-directionally to help the urchin diversify its omnivorous diet. The first, Echinus esculentus, is usually found to be the size of an adult hand, but at Lough Hyne, they can get a bit bigger. It is a fairly widely-distributed species, and found mostly while snorkeling in the lower shore of the Lough. Being equipped with the Aristotle’s lantern, this urchin eats seaweed and encrusting invertebrates by scraping rocks clear as they move across their habitat. Echinus reproduces via free-spawning in the spring, with large females producing as much as 20 million eggs. 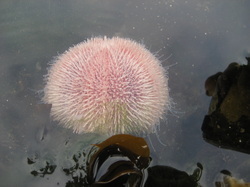 The egg will develop into echinopluteus for 8 weeks then will metamorphose into a 1mm (in diameter) urchin. 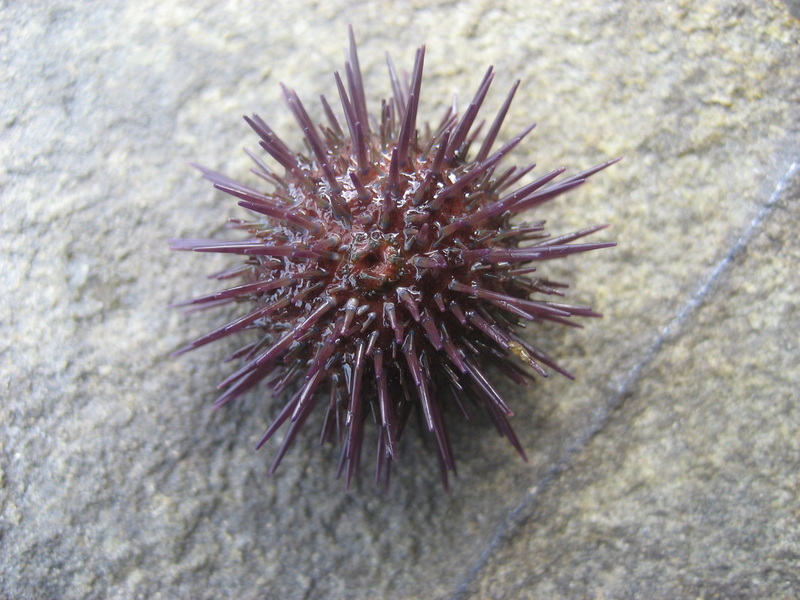 This urchin, depending on conditions, can grow up to 40mm in the first year, and live for 12 years. Paracentrotus lividus is about half the size of Echinus, and is found in the lower shore on rocky substrates. It is known to use its Aristotle’s Lantern and spines to bore into rocks to protect against wave action, desiccation and predation. Here at the lough, they are often found on the undersides and crevices of rocks. Paracentrotus scrapes at algal sporlings, seaweed, and detritus, acting as a control for rapidly growing species. For this reason, Paracentrotus is a key species in the lough, and its decline may potentially be related to the invasion and expansion of many seaweeds within the lough’s shores. Reproduction occurs similarly to Echinus, with juveniles that can grow to 35-50mm in about four years, and it lives up to nine years. Breeding occurs from January to March, and then again in August to September. Psammechinus miliaris habitat overlaps with that of Paracentrotus. Psammechinus lives amongst the seaweeds, which are used as camouflage. Psammechinus eats a great variety of prey, mostly organisms that attach to rocks, such as ascidians, barnacles, and bivalves. 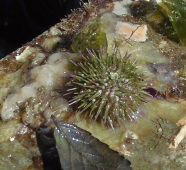 Reproduction occurs similarly to the other two urchins, with reproduction occuring in the spring and summer. Plutei settle after four weeks, when they are at most 1mm in diameter. They grow up to 10mm in diameter in two years, living up to ten years. Source: Fish, J.D., and S. Fish. A Student’s Guide to the Seashore. London: Unwin Hyman Ltd, 1989. Print. Who's living in the shell? 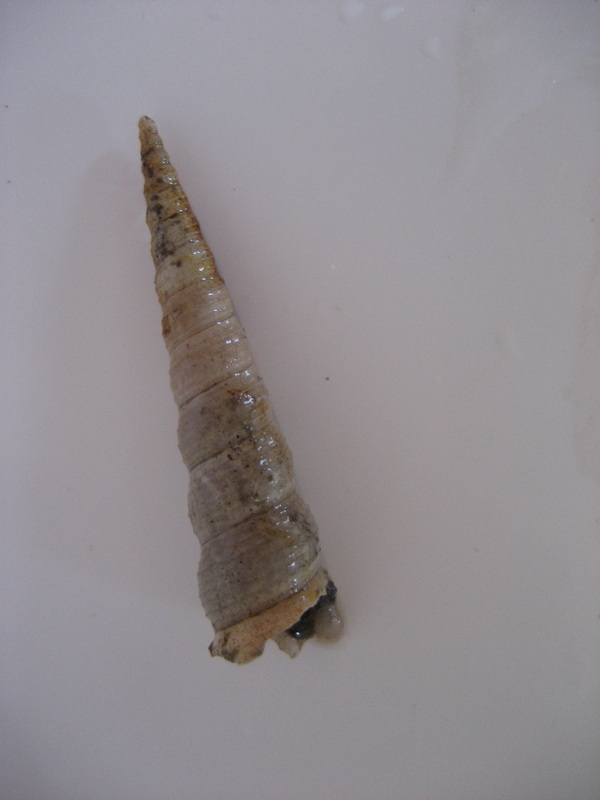 While collecting sediment-dwelling animals from the bottom of the lough, we were puzzled to find an animal living in a snail shell that was obviously not a snail. 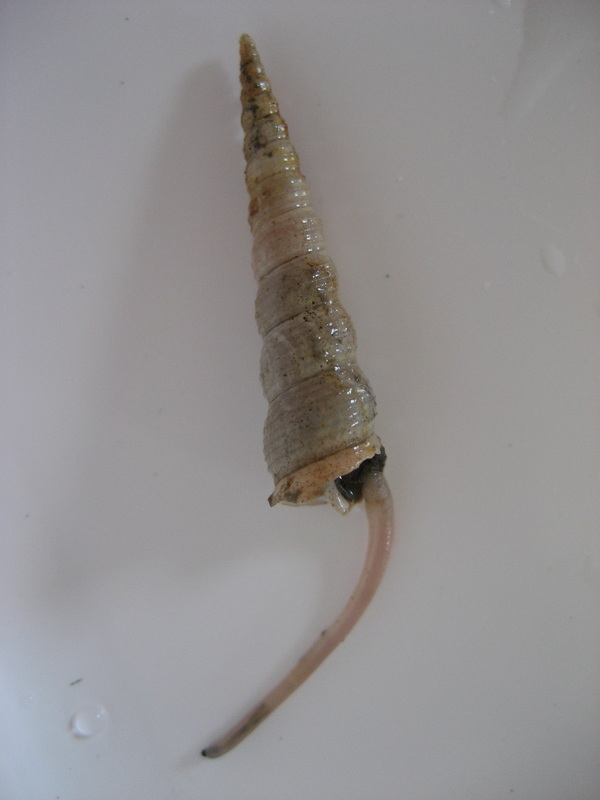 It appeared to have a long tube-shaped appendage that was constantly everting and retracting from the shell aperture. Our colleagues at University College Cork helped us identify this mystery animal - it was a sipunculid, also known as a peanut worm. This species, Phascolion stombi, is often found inhabiting snail shells and worm tubes. 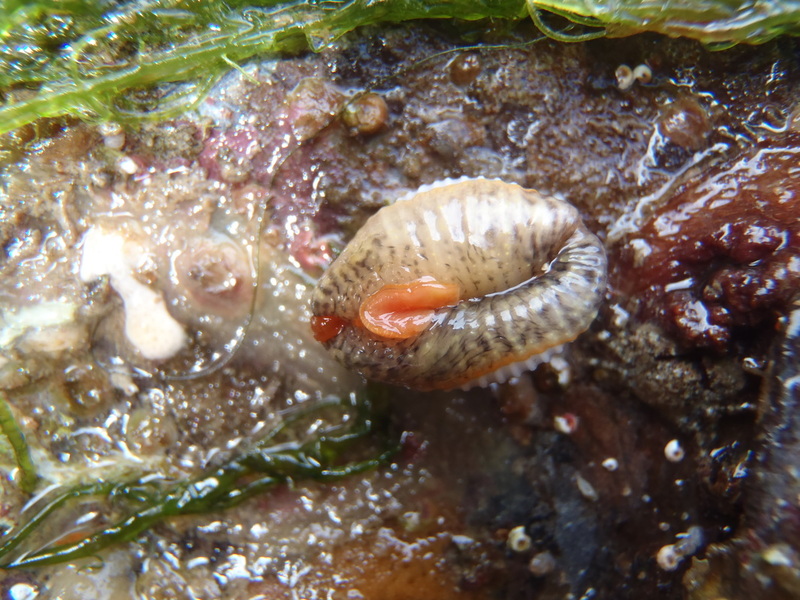 In this case, we found the sipunculid living in a Turitella communis shell (also known as a tower shell).The tube-shaped appendage of the worm is called the introvert, on the end of which is the mouth. Often sipunculids have a characteristic introvert-withdrawing behavior, which is what helped us solve the mystery. You Otter Be Excited About this Animal! In the brightness of morning, an otter can be seen twirling between the lough’s surface and the depths of the water’s edge. It rises to the surface to breath the morning air and roll onto its back, then dives beneath (for up to four minutes!) to hunt for fish. These playful creatures seem naturally designed for romping around in shallower waters with sleek, slender bodies that roll and turn quickly through different dynamic water features. They are extremely strong swimmers, with large lung capacities and the ability to reduce oxygen demands via slowing down their heart rate. Unlike their Pacific Ocean counterpart, the sea otter, river otters do not like to spend much time on their backs, but instead tumble over into the water to either make a second attempt at prey or move back towards their holt with their catch. While frolicking in the water with others, they will often make a loud chirping noise, while hunting calls for a flute-like whistle. Even though the otter has such a great talent at swimming, it actually is a very terrestrial animal, taking all its prey ashore to eat and share with cubs. Females choose rocky nooks or root holds to build a holt with an underground entrance. This is where they rear their two to three cubs, which are taught to swim 12 weeks after birth. Males’ inclinations are territorial, and often will have two or more partner females within their territory, which they mark with dark, fishy droppings. 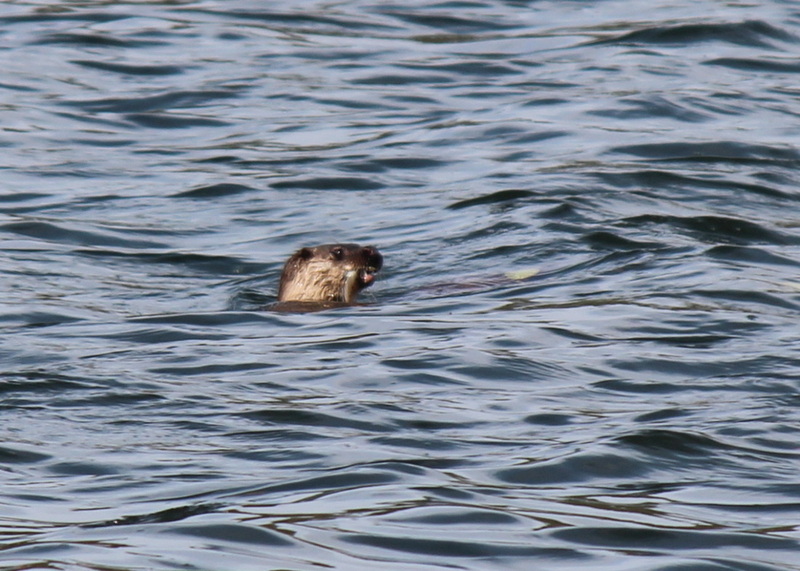 River otters will inhabit coasts, rivers and lakes, but prefer calmer water with vegetation or landscape cover. In the British Isles, otters are very rare, and usually found in Scotland. 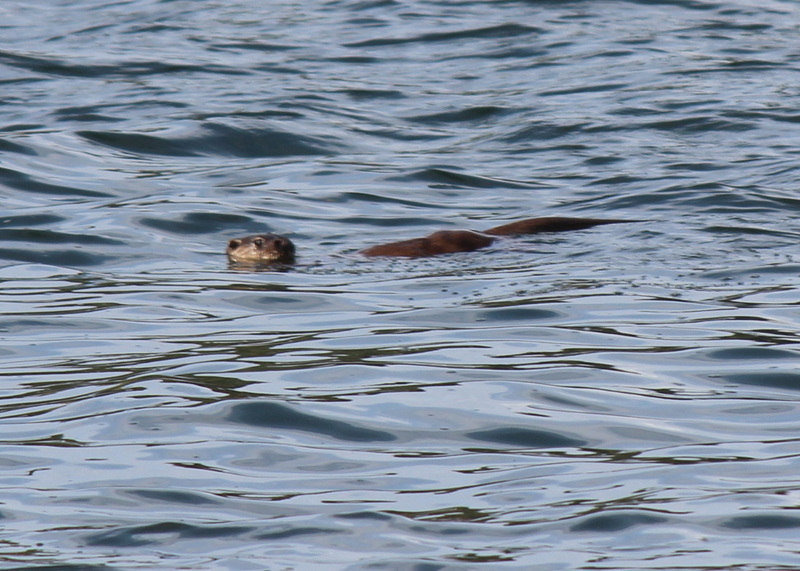 For example: in the twelve years Dr. Trowbridge has worked at Lough Hyne, she has only witnessed an otter twice; once was the sighting just yesterday morning. The otter is protected in the British Isles, but pollution, road casualties, and habitat loss continue to diminish populations. Cowries are something we expect to find in tropical and subtropical waters, but Lough Hyne is home to a species of cold-water cowrie that can be very surprising to an unsuspecting biologist. 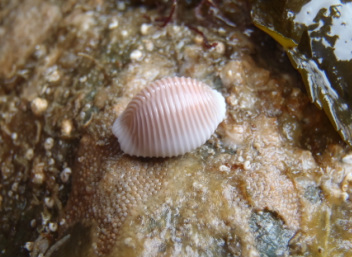 The European Cowrie is found along the entire coastline of Ireland, which is their northern habitat range, and are present southward to the Mediterranean. We were thrilled to encounter Trivia during our under-rock intertidal survey of the eastern shore of Lough Hyne. We found more cowries under rocks on the south shore near the historical Renouf Lab yesterday morning. Cowries are molluscs related to snails and have a soft body inside a beautiful rounded shell. 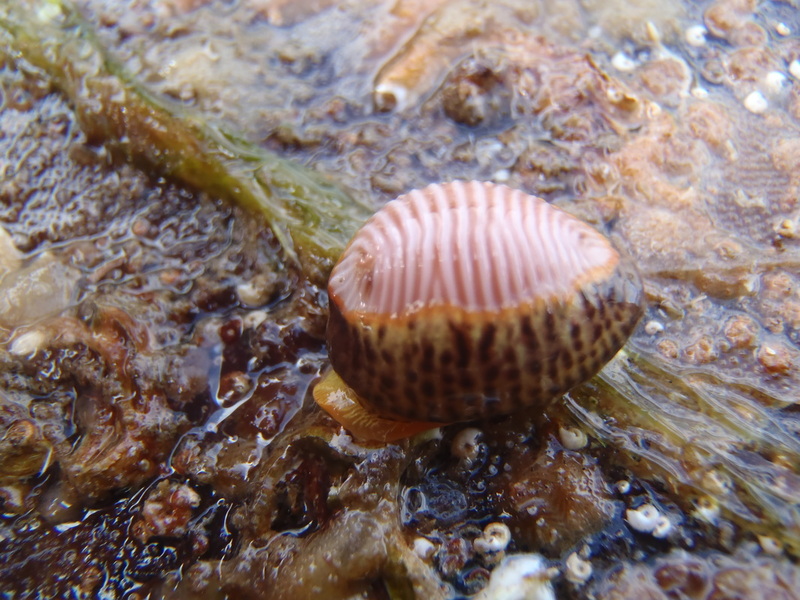 Trivia’s shell is ribbed with pink and white stripes, and a dark-spotted mantle wraps around the edges of the shell. When disturbed, the cowrie will pull the mantle and other soft tissues completely inside the shell. Trivia feeds on colonial ascidians (sea squirts) which commonly populate intertidal rocks in Lough Hyne. Source: Gibson R, Hextall B, Rogers A. 2001. Photographic Guide to the Sea & Shore Life of Britain & North-west Europe. Oxford University Press: Oxford, UK.